As a part of You The Designer’s goal in bringing you everything that’s awesome in the creative world especially in graphic design, we are proud to add another amazing feature in our blog. And this time, we’ve teamed up with our friends from Uprinting.com to bring you an amazing set of downloadable Print Templates – which will definitely serve as a useful resource for all the creatives out there working on design projects related to the printing industry. We currently have 10 types of print products for you to choose from ranging from the most common such as brochures, business cards, postcards, posters and flyers to more specialized and at time hard to find such as door hangers, envelopes, event tickets, menus and calendars. Moreover, each set of templates per product comes in multiple formats including Adobe Photoshop, Adobe Illustrator, Corel Draw, JPEG, Adobe Acrobat and Microsoft Publisher to ensure that all products will be usable no matter what software you are using. And if that’s not enough, each file type of a specific print product gives you templates in various sizes. 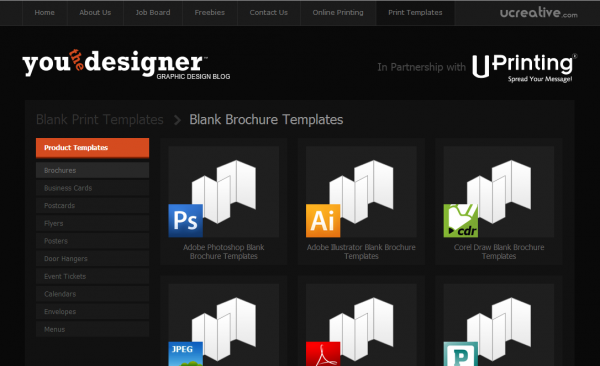 There are over 1,100 different files you can download and use for your designs. So if you need a quick design for your print projects or just a reference for your designs, these templates are all that you might need. But the sweetest deal of it all is that all of these templates are absolutely FREE! Yes, you heard it right, it’s all free. So, what are you waiting for? Check out the Print Templates page by clicking the link above the website or by clicking here. Shoot us some love together with your inquiries and suggestions by commenting below. Stay awesome everyone!